The Avenida Fenix Fire Station in Mexico City. Julio Amezcua and Francisco Pardo attribute their methodol-ogy to a cross-pollenization of American and Mexican ways of producing architecture. Educated at Columbia University, the duo founded their practice in Mexico City in 2001. “We’re always jumping from computers to physical models,” said Amezcua, “and we do a lot of diagrams, which in Mexico is not very common.” But their firm’s name, at103, roots it solidly to its locale: “a” stands for azotea, or rooftop, where the studio sits; “t” stands for Tiber, the name of the office’s street; and 103 is the street number. While this ego-effacing moniker was chosen to characterize the studio as a place where decision-making is shared equally and no individual has sole control, it also speaks to a studied engagement with the distinct urbanism of Mexico City. the interior of the fire station. 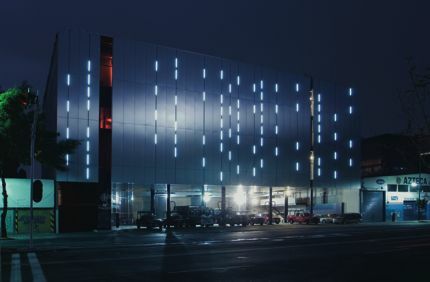 The firm’s first big breakthrough came in 2005, when the studio won a competition to design a fire station on Avenida Fenix in Mexico City’s 16th District. After scrutinizing the program, which called for government offices as well as the typical fire station facilities, the architects decided to open up the building to the public, turning the inside into a sort of public plaza where children can come to watch the firemen at work. They also conducted an analysis of the neighborhood and changed some of the traffic lights on the busy thoroughfare to create a more fluid circulation strategy for the district. This amount of care for the urban fabric sets at103 aside from most of its contemporaries, in any country. A DETAIL OF THE INTERIOR. 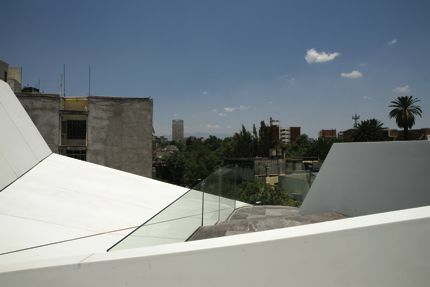 The Ozuluama House in Mexico City. A 200-square-foot sales and education office (technically a maintenance shed) will house a desk for the proprietor, Beth Lieberman. “We wanted to wink toward Bucky domes,” Idenburg said of the pavilion. 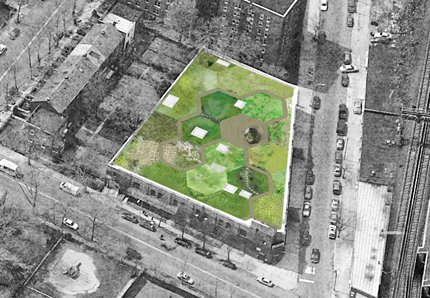 The first hexagon has been planted, and the rest will be filled in as green-roof suppliers express interest. Lierberman plans to offer tours to co-op boards, community groups, building owners, and individuals, as well as to open the space to architects and landscape architects and their clients. 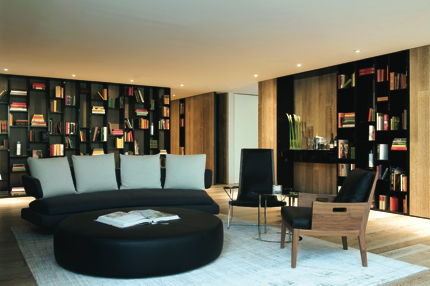 A paneled library-lounge offers homey comfort at this urbane hotel. Buildings by well-known architects are transforming the shaggy edges of Cooper Square and Astor Place, once the domain of college students, homeless people, and Cube-spinning hangers-on. The latest addition, the Cooper Square Hotel, is a striking juxtaposition of old and new, with 19th-century tenements incorporated into its base and a curving, contemporary tower above. The building, designed by New York–based architect Carlos Zapata with interiors by famed Italian designer Antonio Citterio, engages with its context but makes a few clean breaks, as well. “We wanted to create an architecturally significant building to reflect the changes in Cooper Square,” said Klaus Ortlieb, managing partner for the hotel, referring to the architecturally ambitious new buildings associated with Cooper Union. A new academic building by Morphosis is rising next door to the hotel, and the curves of Gwathmey Siegel’s condominium building at adjacent Astor Place are visible from its rooms. A new mixed-use project designed by Fumihiko Maki is also planned just two blocks away on the site of the school’s engineering building. Unlike the developers of those buildings, however, Ortlieb and his partners chose not to clear the site. After initially planning to demolish three tenement buildings, one of which includes protected artists’ apartments, they reversed course and asked Zapata to redesign the building, incorporating the tenements into the new building’s base and creating a contemporary form above. Two apartments, one of which is home to a well-known poet, remain, and are now accessed through the hotel’s main entrance. In retaining these buildings, the developers avoided a messy public fight, which could have tainted the hotel’s relationship with the famously cantankerous neighborhood. (Zapata is no stranger to controversial additions to historic buildings: His most famous project remains the renovation of Chicago’s Soldier Field, designed with former business partner Benjamin Wood.) The hotel’s sleek glass tower, built by Sciame, is narrow where it joins the base and swells in the middle before tapering again at the penthouse level. This Miami-meets-McSorley’s relationship between old and new is interesting and somewhat jarring, but could be read as another iteration of the clashing of styles and repurposing of found objects that has long defined East Village aesthetics. The planned landscape design by Nathan Browning, which will include a large dining garden wrapping around the rear and side of the hotel, may help to bring these opposing sensibilities into greater harmony. The tower (top) has a corporate flavor distinct from the tenements at its base. 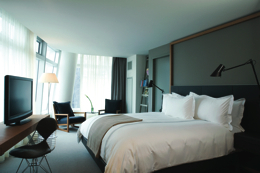 the spare guestrooms (above) offer sweeping views of the neighborhood. 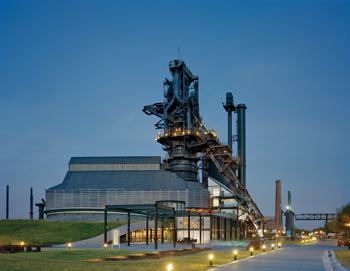 Inside, Zapata has woven a complex and layered sequence of public and private spaces into the narrow site. Bar and restaurant patrons can enter just to the left of the main hotel entrance. The bar area has a curved ceiling covered in black subway tile that forms the underside of a 20-person stadium-seating screening room. Behind the bar and restaurant, bordering on 5th Street, the outdoor garden and dining area will be accessible to both guests of the hotel and restaurant and bar patrons. In the back of the garden, a stair and catwalk lead to an elevated outdoor bar built over the base of the building. On the interior, Citterio used natural materials such as slate flooring, with pieces hand-broken in Italy and shipped to the site, and warm walnut panels in the lobby and the lounge-like library, which is carved out of space from one of the tenements. There is no reception desk, but attendants hover close by and will instantly know your name and preferences. 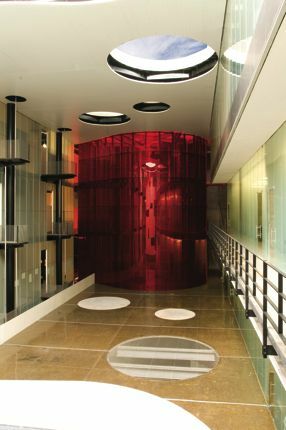 Patterned glass with an abstracted leaf motif lines the elevator core. Citterio designed almost all of the furniture, which was then produced by B&B Italia in a palette of black leather, wood, and steel (a few other pieces, such as seating from Herman Miller and Poliform, are interspersed). The library and the guest rooms are stocked with used books provided by the Housing Works Bookstore Cafe, which are for sale with all proceeds benefiting the nonprofit service provider. A Persian rug in the lobby and subtle floor and side lamps round out these chic but comfortable spaces. “We wanted it to have a residential feel,” Ortlieb said. While the rooms—145 in total, ranging from small, 225-square-foot rooms to junior and full suites—are luxurious without being flashy, none will compare with the two-bedroom, two-and-a-half bathroom 21st-floor penthouse suite, currently under construction. With 360-degree panoramic views and a wide terrace on three sides, the space will surely be one of the most desirable in the city for private events and late-night debauchery. Upgrades to the terminal are likely to leave Nervi's famed rooftop silhouette intact. The George Washington Bridge Bus Terminal is Italian maestro Pier Luigi Nervi’s sole New York building, and though thousands pass beneath it every day, it’s familiar to only a few. The Port Authority station sits astride the Trans-Manhattan Expressway, where it slips below grade between 178th and 179th streets, just east of the bridge’s Manhattan landing. With buses serving northern New Jersey and beyond, it is a transit hub whose commercial potential has never quite been met, and whose architectural character is easy to miss beneath 45 years of accumulated grunge. The Port Authority is trying to change all that. In October they released a proposal for a major overhaul aimed at giving the terminal improved services and a lot more retail space. More recently, local political leaders, current retail tenants, and members of the preservation community have sought to influence the redesign, even as the Port Authority plans to begin construction late this year. 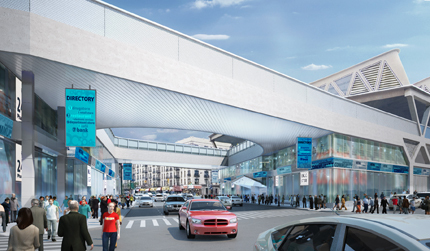 “Our aim is to provide a better retail experience for people who live in the Washington Heights area,” said Port Authority spokesman Steve Coleman. 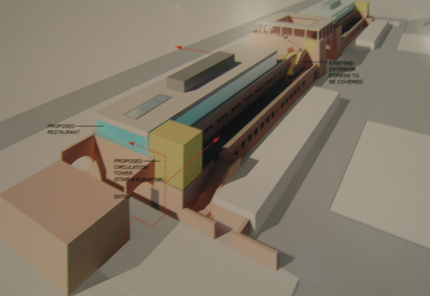 The plan as originally announced called for the relocation of several of the small retailers presently on site; after a mid-November meeting with community leaders, the Port Authority revised and clarified that plan, stating that rather than a single big box anchor, a number of new stores would occupy the renovated facility. The Port Authority will fund a third of the $150 million budget, with developers P/A Associates and Arcadia Realty Trust responsible for the remainder. The developers have selected Robert Davidson of design/build firm STV as project architect, and the choice would appear to be a significant one: Davidson planned the new transit hub for Ground Zero, and he helped select Santiago Calatrava to build the PATH station there. Calatrava has cited the Nervi bus terminal as a major inspiration for his design. That connection, however, offers no certain measure of how deferential the redevelopment will be towards Nervi’s structure. And P/A’s Carolyn Malinsky gave a qualified assessment of the building, saying that “the Nervi roof is not actually a historical structure,” while insisting the redevelopment would leave the award-winning concrete coffers intact. Nervi fans may be interested to know that the architect designed one other major public work on the East Coast, an arena in Norfolk, Virginia known as the Norfolk Scope. A near-replica of Nervi's arena for the 1960 Summer Olympics in Rome, the structure, designed with local architects Williams and Tazewell, opened in 1971 and was awarded the 2003 Virginia Society of the American Institute of Architects' "Test of Time" award. 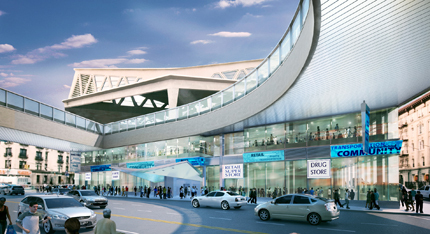 The terminal's overhaul will feature glassed-in retail space at street level. Claiming to be the first city to do so, San Francisco’s government is proposing to establish its civic center neighborhood as a “Sustainable Resource District.” On September 24 at the Clinton Global Initiative, Mayor Gavin Newsom unveiled plans to pursue energy and water conservation strategies over the next three years for seven buildings and public spaces in the area, including City Hall and the Civic Center Plaza they surround. 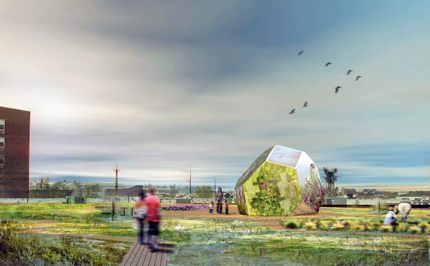 The San Francisco-based Architecture firm KMD, formerly Kaplan, McLaughlin and Diaz, provided pro-bono consulting services to develop an overall framework of green initiatives. The scheme calls for a variety of potential energy conservation strategies, which may include ground source heat pumps, alternative fuels, photovoltaic panels, and wind turbines. Administered by and funded with money from the City’s Public Utilities Commission, supporting engineering has been provided by a team of firms, including Omaha-based HDR for lighting evaluation, the Oakland-based kW Engineers for HVAC assessments, and the Dublin- and California-based Intergy Corporation with the Massachusetts-based Metcalf and Eddy to evaluate water conservation and waste water management. Several of the district’s initiatives compare favorably with LEED standards. The plan’s goal of an 80 percent water-use reduction in the area is double the LEED maximum in that category. Other goals, all close to LEED guidelines, include a 45 percent reduction in wastewater discharge, meeting 35 percent of peak power demand by renewable energy, and a 33 percent overall reduction in energy consumption. While the initiatives are not currently registered as a LEED project, the city expects to examine its potential compliance following completion of the evaluation process. According to the Clinton Global Initiative more than 30 states, 600 cities, and 500 universities in the United States are developing comprehensive action plans to reduce heat-trapping gases. San Francisco’s plan aims to reduce the district’s annual carbon footprint by some 2,225 tons, equivalent to the greenhouse emissions of 1,286 San Francisco households. 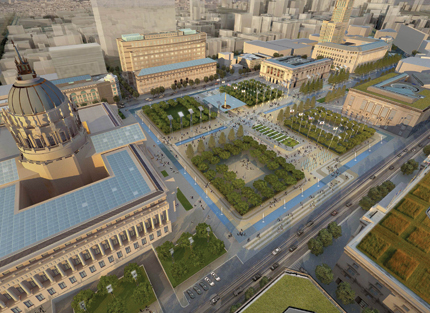 Evidence of the greening of the Civic Center should be visible beginning in late 2009, when the city hopes to complete the early phases of implementation. Renderings published on Mayor Newsom’s website suggest rooftop photovoltaic arrays on several prominent civic center buildings. Whether viewed by tourists, residents, or official visitors to San Francisco’s Civic Center, the visible evidence of this greening initiative will further the mayor’s efforts to lead by example in the city’s overall goals for energy efficiency, which also include requiring new commercial buildings to employ solar energy methods; streamlining the installation of solar technologies in private homes; creating energy efficiency plans for the city’s major institutions, such as the airport, libraries, and municipal railways; and making a commitment to power all government buildings with renewable resources by 2010. About 100 onlookers gather at the MAS viewing of the Tribute in Light. 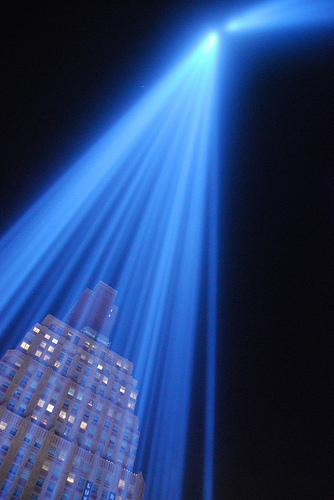 With the possible exception of Las Vegas, New York City could easily claim title to the country’s brightest city. Maybe it is simply the kinetic energy of the City that Never Sleeps, but there is little question that as the sun sets, the city comes most alive. From Times Square to Coney Island, from the Empire State Building to the Statue of Liberty, from candlelit bistros to strobe-lit night clubs, New York is a city of lights. 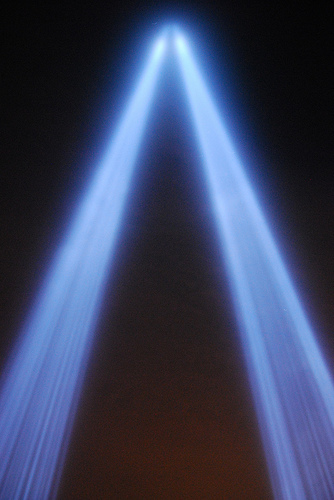 It is fitting, then, that on the darkest day of the year, New York should turn to two towering beacons of light to remember the people, and the landmarks, lost on September 11, 2001. An Apparitional Barwick speaks to the crowd. 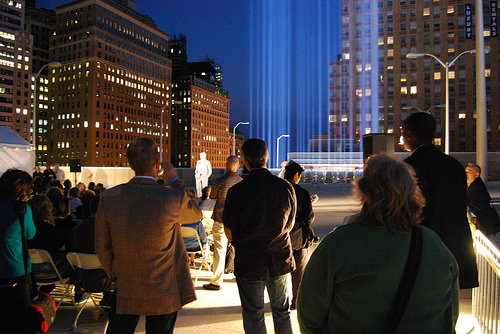 The MAS was hosting a semi-private viewing of the memorial last night, attended by the group’s staff and members, the project’s designers, lots of photographers, and a few volunteers from the local Audubon Society—it being migrating season, the birds can become disoriented by the lights—along with some light refreshments. 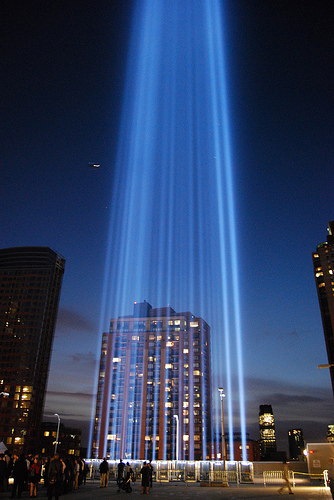 Despite the somber occasion, there was a certain air of awe and even joviality in the crowd owing to the sheer magnitude of the array—88 lights arranged in two 20-foot squares throwing off 7,000 watts each. The lights had been visible at times throughout the past week while they were being tested, but only last night did they burn from dusk until dawn. 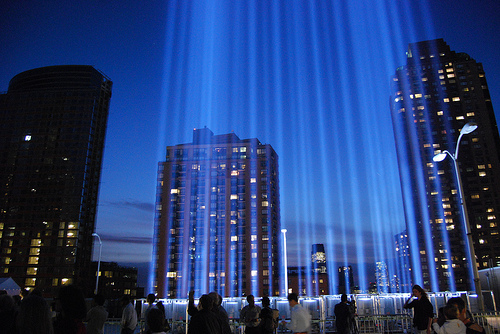 At first invisible, the beams quietly materialized like solemn apparitions, standing watch until the new sun rose, and with it, another day in the city. 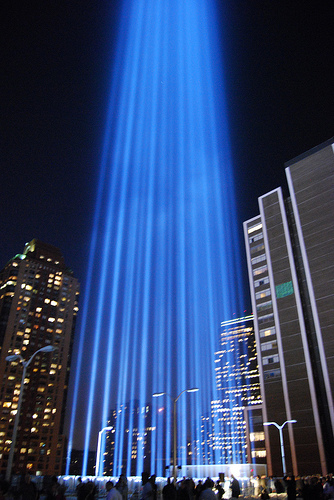 When dust blew threw the beams, happening often on such a blustery night, many onlookers spoke of ghosts or angels. Massimo Moratti, the lead technician for Space Cannon, the Italian search light company that fabricated the special lamps, told the crowd it was such an honor to be here on behalf of his family. “My daughters, they start school,” he said. “They say, ‘My father go to New York, strike the light for memory, for the Twin Towers.’ Everyone is so proud.” Moratti has made the journey from Italy every year to oversee the “striking” of the lights. “This quest,” he added, “is very important to remember. Remember every time." Visitors take in the meMorial. The idea for the project was initially rebuffed by Mayor Rudolph Giulliani, but even when his successor, Michael Bloomberg, approved, there was a great deal of concern it would not be well-received by the city. Frank Sanchis, the senior vice-president at MAS and man who spearheaded the memorial, said that the response has been so overwhelming, the group is committed to keep it going at least until the permanent memorial opens, which was the original mandate. With that project incomplete, Sanchis hopes to persevere. “It really has taken a hold, in New York and beyond” he told AN. “They’re really aware of it around the world. The lights are something America can really be proud of, and in a non-political way.” Down on the street, Sanchis' dream had come true. Firefighters and Chasidim clutched beers hand-in-hand outside pubs. Mourners gathered around impromptu memorials. Tourists, speaking a babble of languages, mobbed Ground Zero. 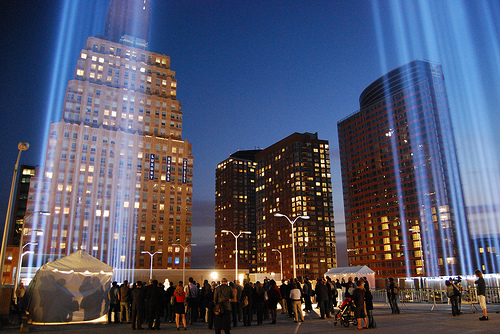 But all, from time to time, silently craned their necks skyward. The new look of McCarren Pool. Hipsters, grab your swim trunks, because the new McCarren Park Pool is officially on its way. 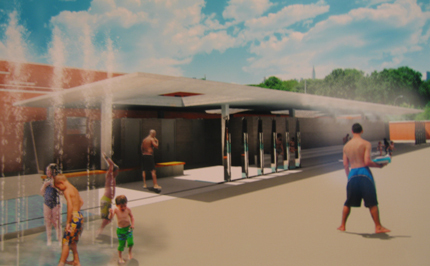 Today, the Landmarks Preservation Commission unanimously approved plans from the Parks Department to restore and renovate the pool to its Moses-era glory, along with new amenities called for by the community. After a three-year reign as North Brooklyn’s premier concert venue, and three decades of disuse before that, the pool should be back to its intended use by 2011. 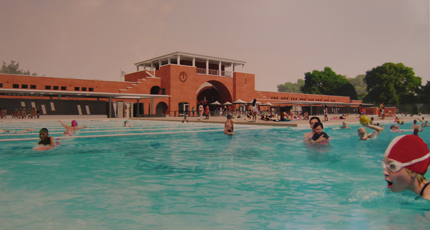 The plan, designed by Rogers Marvel Architects, calls for a thorough restoration of the original bathhouse, completed in 1936 by the Works Progress Administration, as well as reconfigured wading and diving pools, a “beach” platform that can accommodate an ice-skating rink, and new year-round recreational and community spaces within. “You have to respect the existing architecture and open space and at the same time create a 21st-century facility,” Jonathan Marvel told AN after the commission voted 7-0 in favor of the project. Given the pool’s high profile in the Williamsburg community, both new and old, as well as its widespread coverage in the press, the hearing was sparsely attended, drawing only minor criticism from the few preservationists who spoke, all of them in favor but for this minor ahistorical detail or that. “We are sorry to see the Parks Department adopt an agenda that fills so much of the formerly open space with concessions, administrative paraphernalia, and alien attractions,” Christabel Gough, secretary of the Society for the Architecture of the City, told the commission. “It turns a sophisticated design of the 1930s into kitsch with a beach.” One speaker lamented that one walkway would be five feet deeper than its counterpart, disrupting the pool’s symmetry. Marvel countered that, like all successful restorations, the needs of past and present had to be balanced, a sentiment the commission strongly agreed with. “For the resources the city is dedicating to this, we’re going to need year-round use from this facility,” commissioner Elizabeth Ryan said, responding to attacks on the skating rink. Commissioner Pablo Vengoechea said that the architect’s attention to detail was homage enough. “I think the work is certainly monumental, the amount of work being done to restore this,” he said. Marvel said the architects had the good fortune of a nearly complete set of drawings on file at the Parks Department. This is how the decision was made to keep a spray park on the northern side of the pool separate, as drawings and photographs suggested that had always been the case, despite the seeming asymmetry it brought to the overall design. The drawings also allowed for carefully matching new windows and doors that have long been destroyed and boarded up. The designers even hope to peel back decades of graffiti to reveal the original rare bricks, though paint will be used if necessary. “There is a kind of ruggedness of the McCarren complex, and we love that ruggedness but we also want to make it as beautiful as possible,” Marvel said. Another dispute arose during testimony when some speakers brought up a proposal for a glassed-in, rooftop restaurant, not wholly unlike the architect’s proposal for a hotel atop the Battery Maritime Building. Though the plans had been shown last week to the community and preservationists, a Parks Department official told the commission that the restaurant was not presented today because it would come at a second phase, with a separate review, if it was pursued at all. As for concerts, Stephanie Thayer, the executive director of the local nonprofit Open Space Alliance, which advocates for park space in the neighborhood, said she remains optimistic for concerts to continue in the pool during the off season—between swimming and skating—as well as during the summer at one of the numerous parks developing along the waterfront. Thayer was also recently hired by the Parks Department, as its North Brooklyn administrator, which could help the new venue become a reality, whether in the pool or elsewhere. Before and after shots of the pool, with minimal changes. The beach/rink can be seen in the foreground of the bottom shot, with the changing pavilions to the sides. 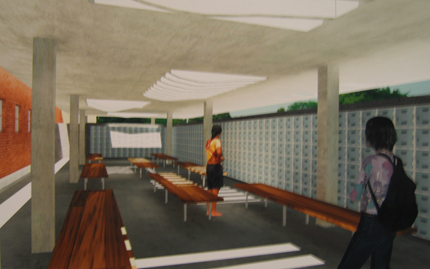 East and west elevations of the pool with glass additions for restaurants. 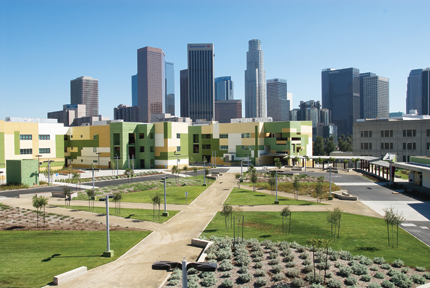 Downtown Los Angeles’s Edward R. Roybal Learning Center (aka Central Los Angeles High School #11), a colorful new high school just blocks from the heart of the city’s skyline, finally opened its doors for students on September 3 after a roughly 20-year wait. Yes, 20 years. Formerly known as the Belmont Learning Center, Roybal, which sits over part of the Los Angeles Oil Field just west of the 110 Freeway, is one of the most notorious building projects in California history. Since its inception in 1988 the school, which has cost almost $400 million, has been delayed, partially demolished, in limbo, and then, finally redesigned by local architects WWCOT. First designed by McClarand Vasquez & Partners, the school was largely complete when construction, which started in 1997, was halted in 1999 after tests revealed methane and hydrogen sulfide gases in the ground. Later examination in 2002 showed that the site sat on a major earthquake fault. The school’s fate was unclear until WWCOT took over in 2003, starting construction in 2006. The contractor was Hensel Phelps, and the project manager was Rick Hijazi of TBI and Associates, a consultant to the Los Angeles Unified School District (LAUSD). “Our lawyers advised against it,” said Andrea Cohen Gehring, design principal at WWCOT. “But we decided that someone had to step up and something positive had to happen on the site.” The result, she said, was incredibly rewarding. “It’s probably the most interesting, complex, and exciting thing we’ve ever done in the history of this firm,” she said. And certainly one of the most challenging. First the firm led the removal of mold and vermin and the replacement of deteriorating systems from the long-abandoned site, which Gehring referred to as a “new ruin.” To manage underground gases the team built a mitigation system that traps gases through sand, soil, and a plastic membrane and when levels are high vents them through conduits located in and around the school. To manage the earthquake threat the firm ensured that all buildings were set back the minimum fifty feet from the fault. That meant demolishing one of the school’s four classroom buildings and its administration building. Brand new replacements include another classroom building and a multipurpose building that includes a cafeteria, a library, a bookstore, music and dance rooms, and the school’s maintenance offices. The final result of the 2,800-student, 310,000-square-foot, 104-classroom high school is a thoughtful merger of the new buildings and the original four-story design. The aborted first attempt at the school cost about $175 million and the new work cost $200 million, said Hijazi. To save (now limited) money the firm maintained the original staggered structures, which line Beaudry and 1st avenues, wherever possible. 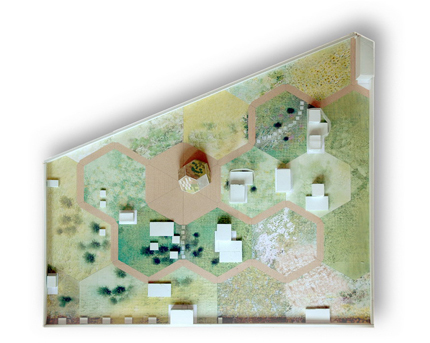 They covered the school’s formerly red colors with a patchwork of green, white, yellow, and beige meant to reflect the city’s desert environment and create visual interest. “We decided to create a tapestry that would be less bulky and create a strong pattern,” said Gehring. Its colors and composition are further echoed in the landscaping, by Rios Clementi Hale, a centralized series of pathways and green spaces dominated by draught-tolerant plants. The lower-lying and sleeker new buildings lie on one side of this inviting central green and the bulkier, more institutional original buildings wrap around the other. The firm also decentralized the once behemoth school, creating small learning communities that are differentiated inside by color and each have their own administration facilities (some classrooms were turned into offices to facilitate this). To take advantage of the climate, WWCOT not only centered activity on the large green courtyard but built outdoor stairways, cafeteria seating, and covered walkways, and created dramatic overhanging rooftops for the new buildings. A large metal mesh screen on First and Beaudry serves as the main marquee for the school for those in the bustle of streets downtown. From the protected main green one sees the skyscrapers of downtown shoot up dramatically behind the rest of the school. The 33.5-acre site contains several fields and a large gym, and just next to the school Mia Lehrer Landscape Architects created the rolling 9.5-acre Vista Hermosa Park, which is shared by the school and the local community. It is the first new park in downtown LA in decades. 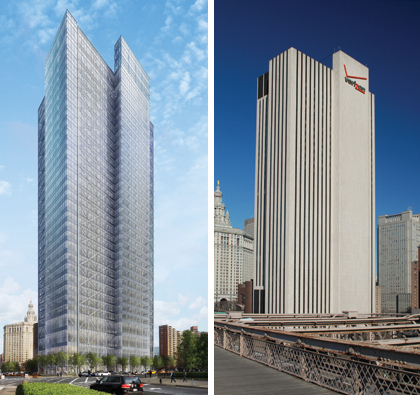 A new look, left, for 375 Pearl Street, right. The tower at 375 Pearl Street hovers ominously above its waterfront neighborhood: a stark, largely windowless tower, disparaged by critics and unloved by neighbors. As a phone-company switching station that housed more equipment than human employees, it didn’t need transparency. 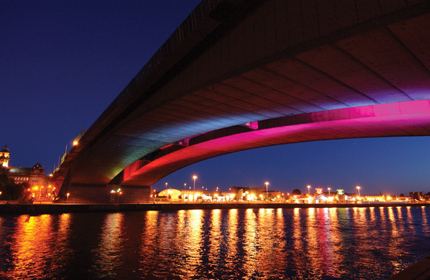 It was a critical component of the city’s communication infrastructure, but its prime location and the advances in digital miniaturization that have obviated bulky copper wiring make it an appealing site for denser uses. Verizon consequently sold most of its interest in the tower. And soon it will shed an inefficient skin in favor of panoramic views, dramatic environmental gains, and enhanced amenities for tenants. 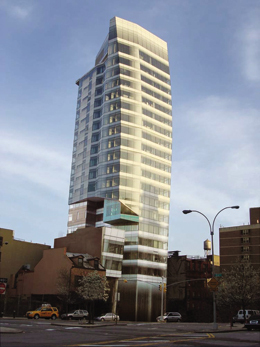 The developers, architects, engineers, and consultants on this project (and comparable ones like 1095 Sixth Avenue and 1175 Broadway) are not only making old buildings suitable for today’s marketplace, but implementing the principle that the greenest building is the one that is already built. “Existing buildings in New York are our greatest opportunity for creating a sustainable city,” says Peter Aaron, associate partner at Cook + Fox, who is working with principal Richard Cook on the revival of 375 Pearl. “According to the mayor’s PlaNYC, 85 percent of our CO2 emissions in 2030 will be created by buildings that exist now.” Cook + Fox is one of several local firms exploring curtain-wall upgrades and associated renovations to make these buildings better neighbors, creating high-value spaces more quickly and sustainably than new construction allows. The modernizing of the forbidding 375 Pearl is an unambiguous boon to lower Manhattan. With its blank bulk, its oversized corporate logo, and its 360-degree harbor and river views wasted on inanimate objects , it’s a frequent flyer on lists of the city’s worst skyscrapers. One New York Times reporter recently called it “the tower that has no friends”; practically any change would strike observers as an improvement. But the renovations, set to begin once an anchor tenant is secured, are not limited to aesthetic remediation. To transform an anti-icon of mid-1970s Brutalism into a lighter, greener component of the skyline, new owners Taconic Investment Partners and Square Mile Capital have assembled a design and construction team including Cook + Fox, Israel Berger Associates, and Tishman, along with structural engineers Severud Associates and mechanical engineers Jaros Baum & Bolles. The plan calls for full recladding on three sides and window replacement on the west face near the core. 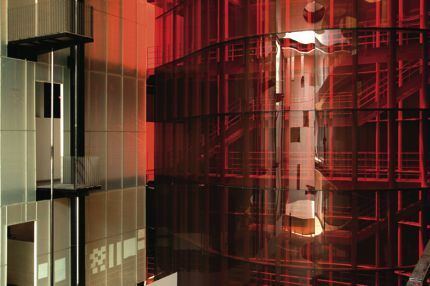 The curtain wall, made of very clear glass with a heat-gain-reducing custom frit pattern, will display the robust geometry of diagonal steel bracing beams, originally built on the perimeter under the assumption that the interior would never be seen. Materials recycling here, said Aaron, is “a no-brainer”: some 300,000 square feet of limestone cladding can be “literally quarried from the building” for other uses, along with 40,000 cubic yards of concrete and 18,000 tons of steel. The building has good bones: slab heights averaging 15 feet (23 feet on some levels) allowing for daylight-harvesting lighting systems and energy-efficient underfloor air delivery, 40,000-square-foot floors with an unconventional side-load core creating large unbroken floorplates, clean-finished dustproof and fireproof concrete ceilings, and a framing system (built for racking telephone switches) that allows for inter-floor routing of cables and wiring. Aaron reports that 375 Pearl will receive a new mechanical system and core with Class A elevators; high-efficiency chillers, pumps, and air-conditioning machines with 95 percent filtered outside air delivered to each floor; and a rooftop rainwater-capture system. The architects are studying additional energy-generating options including photovoltaics and wind turbines. An improved public plaza and a reoriented entrance will strengthen the pedestrian connection to the South Street Seaport neighborhood. This is one reskinning that will extend well beyond skin deep. Eight rooftop solar panels provide electricity and hot water. It’s hot, dry, brown, and dusty—and for some, a personal paradise. Welcome to the California high desert, where a pair of Los Angeles-based architects, Linda Taalman and Alan Koch, have finished construction on their own 1,100-square-foot getaway. 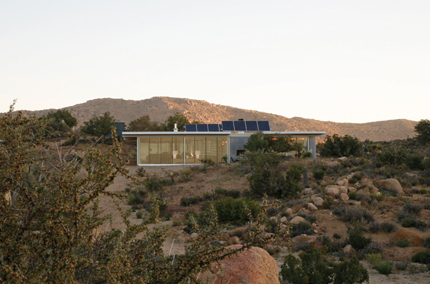 An experiment in hands-on minimalism, the house sits on a remote five-acre site in Pioneertown—just beyond the northwestern boundary of Joshua Tree National Park—and two hours east of Los Angeles. A husband and wife team, Taalman and Koch bought the land in 2006, and with the help of friends and family, built much of the house themselves. It’s a project they had been contemplating since moving their design firm, Taalman Koch Architecture, to Los Angeles from New York five years ago. 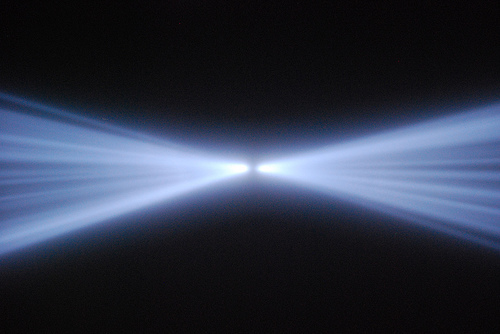 The couple, who met at Cornell and founded OpenOffice arts + architecture, relocated shortly after completing the design and renovation of the Dia:Beacon museum in Beacon, New York, in 2003. Their move west was precipitated by a desire to experiment with new building materials and construction techniques, and to have a more direct role in seeing buildings they had designed come to life. 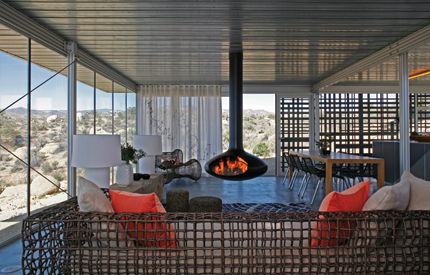 THE OPEN LIVING ROOM FEATURES A HANGING FIREPLACE AND STEEL ROOF (above). Beneath the solar panels, THE HOUSE offers LARGE OVERHANGS FOR SHADING (below). The Off-grid iT house is the result of the couple’s latest experiment in mixing prefabricated and on-site construction techniques. The aluminum framing, steel roof, cabinets, and 3-form bathroom walls arrived ready to install, while the concrete foundation and electrical and plumbing systems were fabricated to meet site-specific needs. 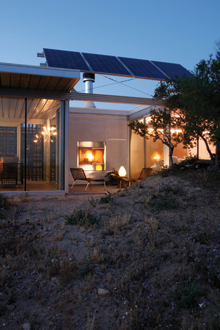 Since the house is two miles away from the nearest electric tower, Taalman and Koch engineered an off-the-grid power system that includes eight solar panels, four of which are on the roof and provide electricity, while two additional panels serve as the house’s solar water heater. A sizable overhang shades rectilinear floor-to-ceiling windows, some of which are patterned with a vinyl decal grid that functions both as a shading device and a privacy screen. The strategy for enclosing the living quarters is equally low-tech: the bedroom area is nestled between a small hill and a cluster of acacia trees. A pair of outdoor courtyards completes the rectangular floor plan, creating the same sense of easy indoor/outdoor living popularized by modernist architects working in California during the 1950s and ‘60s. The house was designed as a kit around a modular floor plan, with open sections that can be shifted or mirrored to meet the client’s space and privacy needs. Taalman is unsentimental about the notion of site specificity, believing, as many modernists did, that architecture can become more accessible by way of being more generic and, in turn, more easily reproduced. The iT house may seem one-of-a-kind, but the firm has built three others just like it in Villa Park, Paso Robles, and Three Rivers, near Sequoia National Park. “The idea of the house is that ‘iT’ can be whatever one wants it to be, it’s up to you to fill in the blanks,” explained Taalman. Jonathan Segal's K. Lofts, a nine-unit residential project in San Diego's Golden Hill neighborhood. The building integrates the structure of the site's former building, a Circle K gas station and convenience store. Over the last hundred years or so, architects have watched their roles shrink to the point where “master builder” no longer applies. Now they seem relegated to the periphery, edged out of economic and even aesthetic control by powerful developers. But a few intrepid CAD jockeys are working to take back control as developers of their own projects. While assuming new risks (the possibility of economic disaster) and responsibilities (even more work), they’re also reaping rewards that come with increased artistic and economic freedom. The trend is nationwide, but one of its epicenters is a place not known for architectural innovation. That would be San Diego, where a tight-knit community has developed around this pursuit, producing moderately-sized projects along the edges of downtown, and lending to a city dominated by faux-historic homes and banal high rises a much-needed shot of architectural character and sensitivity. In Smith’s wake have come several loyal followers—some from within his own firm—who decided to develop on their own. His most successful protégé is Lloyd Russell, a young architect with whom he developed and designed the Essex and the Merrimac. Russell, who was awarded the AIA San Diego chapter’s Young Architect of the Year Award last year, has gone on to build his own unique house/art gallery/office in a structure, also in Little Italy, that he calls the Triangle Building for its shape; defined by its odd and quite narrow site. He is working as well on a development project in San Diego’s Hillcrest neighborhood and also one in Portland, Oregon. Like Smith, Russell said his favorite part of developing is the creative control and the ability to transform the city for the better with thoughtful infill projects that mesh with, instead of ignoring, the urban fabric. He feels for those still stuck in the architectural treadmill. “It’s a sad thing to watch students get out of school and slam against reality. Their beautiful dreams become a mansard roof on a Safeway,” he said. from top: The Merrimac, built by Ted Smith and Lloyd Russell as part of the LIND project; the Essex, a unique mult-family project downtown also by Smith and Russell; the Triangle Building, Russell’s first solo project, has a narrow plan that is shaped, not surprisingly, like a triangle. The other major force in the architect-as-developer world is Jonathan Segal, who since 1990 has built 15 medium-sized projects downtown or nearby. Using a simple but elegant palette of materials like concrete and raw steel, he designs spaces that feel much larger than they actually are. His projects include K Lofts and The Union, buildings in Golden Hill with rooftop solar panels to help offset energy costs and that combine affordable and market-rate rental housing. Working relentlessly, Segal has become the most financially successful of the lot. He said he recently sold 141 of the 171 units that his firm has built for an impressive $45 million. Segal has a garage full of vintage speedster cars, proof that developing your own projects can reap financial rewards. “Ted wants to save the world and Jonathan wants to own the world,” joked Russell. Of course, Segal and others warn that development is not for the faint of heart. Any project can go awry, causing the architect to lose his or her shirt; and with the market taking a downturn, the risks have only increased. Russell said his bank account sank to $20 when he worked on his first project, the Merrimac, although things are much easier now. Securing funding and making insurance payments can make things difficult to get underway. And the amount of work and stress in managing everything from obtaining loans to cozying up to assessors can be a grind. Segal admitted that he now recruits more help than he did in the days when he worked seven-day, 80-hour weeks, handling everything from drawings to electrical work. “Sometimes you’re dealing with bills and the bank and with the appraisals and doing other stuff where you’d rather be designing,” said Segal’s former employee Sebastian Mariscal, who is himself now developing the most high-end projects of the group. Mariscal’s Six, an ipê-clad condo project in La Jolla, has units that range in price from $2.3 to $2.9 million. Indeed, these practitioners all claimed that hands-on development brings phenomenal lessons, insights, and benefits. These range from cutting out the middle man to learning when contractors are pulling a fast one, knowing how high to bid on a property or the most efficient means of welding. Mariscal, who has his own crew of contractors, has learned to order materials for multiple projects at once to lock down prices. Russell said that familiarity with the construction side has given him inspiration for design. He constantly gets tips on detailing from his builders; for example, the uneven concrete facade of his Triangle building, a nod to the staggered wooden formwork, he said, was inspired by a suggestion from one of his construction workers. Such lessons are being passed on by Smith, Russell, Segal, and Mariscal. Together, they teach a Masters in Real Estate Development at Burbank’s Woodbury University. Classes are held in the Merrimac Building. The twelve-month, three-semester program is entirely studio-based. For the thesis, students develop finished presentation packages for a project, including market analysis, partnership agreements, funding proposals, architectural designs, and sales and leasing strategies. Already, several new architect/developers have emerged from the class, including Mike Burnett, who is working on a Golden Hill mixed-use project; Ginger Reyes, who is breaking ground on an infill project in Riverside; and Dominic Chemello who is starting a house addition in Escondido. This adds to a growing number of practitioners in the area, including Kevin DeFreitas, who is working on several lofts and rowhouses around downtown; Graham Downes, a successful designer of local hotels, lofts, restaurants, and offices; and Public Architects (who are actually in the process of moving away from development to design larger projects). Even Kirk O’Brien, president of AIA San Diego, develops his own projects, and is a major proponent of the movement. “I’ve traveled around the country for my AIA duties, and I’ve never seen a community like this,” said O’Brien. Others point to scattered pockets in Portland, Chicago, New York, even Omaha, Nebraska. But nowhere does the phenomenon seem as focused and energized as it does in San Diego. Ron Radziner, principal at LA-based Marmol Radziner, has developed some of his projects, and his company, which employs over 70 people on its building side, constructs most of them. But he admits that there’s really nothing in LA like the community in San Diego. “There’s a culture of do-it-yourself,” said Radziner, who credits the strong influences of Smith and Segal for pushing the movement. Russell hopes the culture will continue to thrive, even while the economy slips and downtown development continues to push smaller projects further to the periphery.